Baking has been my passion since I was a little girl. I've always preferred it to cooking. Except when it came to making pie crust. 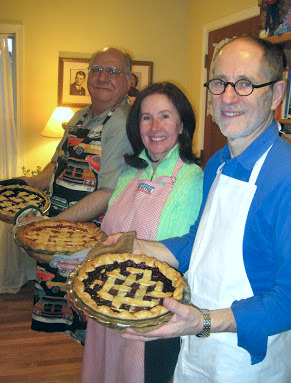 That was something to avoid until I met Kate McDermott, the "pie whisperer". 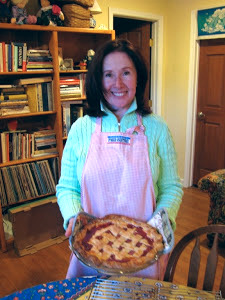 Her legendary pie making classes in Seattle gave me the confidence I needed. I am forever indebted to you Kate! Pie wisdom, as spoken by Kate- I like to keep things simple in my life. Pie dough is no exception. It’s a simple mantra that I repeat when making dough. 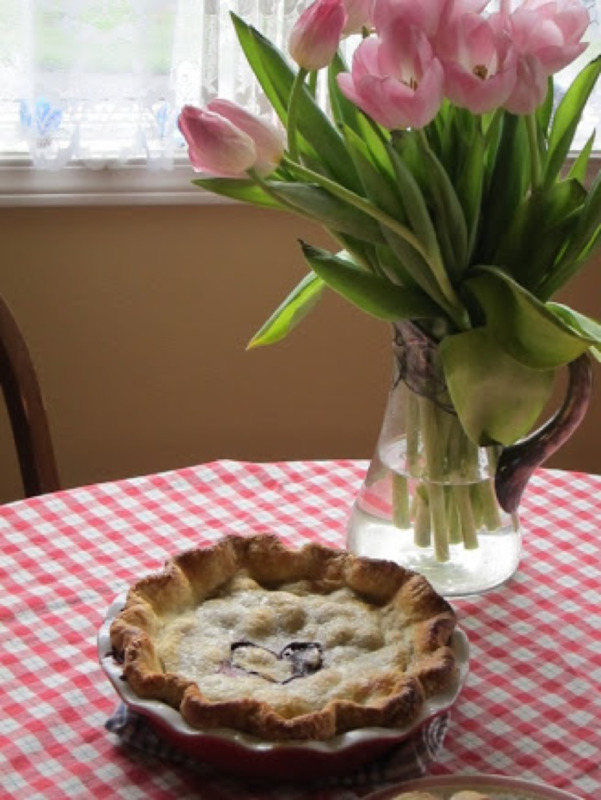 There are a lot of recipes out there for pie dough. I’ve had great success with this simple one. I teach it in all my classes. It’s simple and basic. So many have asked for it that I’d like to share it with you. Put the bowl and flour into the freezer. Pie Making Rule #1: Keep everything as cold as possible; bowl, flour, fats, hands. I keep a mixing bowl in the freezer all the time along with a bag of flour and my pastry cloth. I love King Arthur All Purpose Flour (Red Bag). After experimenting with different flours over the years, I can honestly say that there is none that I like better. King Arthur, in Norwich, VT has been around for 220 years so they know a thing or two about flour. This is not to say that I’m not open to different flours. I would love a flour that is within my 100 miles and I’ve tried some that are. IMHO, none approach the quality of King Arthur. It’s silky, smooth and just makes a great crust. 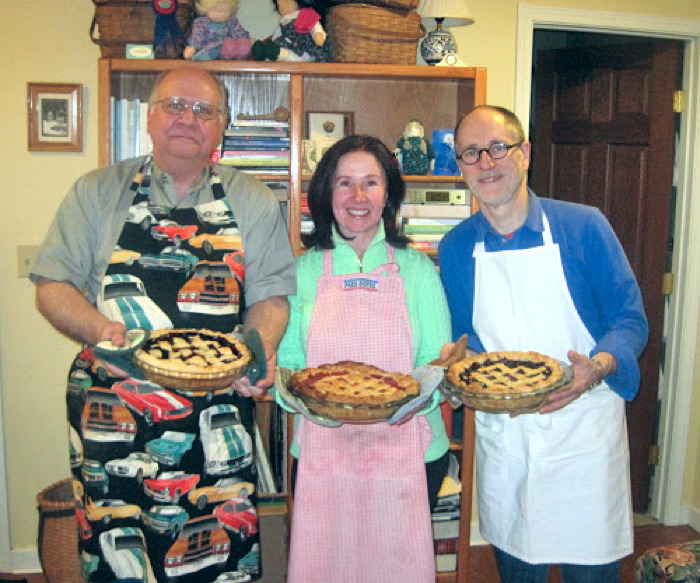 I would like to give a pie class to wheat farmers in the Pacific Northwest and show them just what a pie maker needs. Can you imagine regional wheat grown specifically for pie with a big picture of an apple pie on the front of the bag? OK, I digress. Let’s talk about measuring. This may blow your mind but I’m not an exact measurer. I don’t sift, fluff or mix the flour. I just dip in with a metal cup that I bought for five cents at a yard sale. It’s my cup. I’ve also found that a standard coffee cup (not mug) measures pretty close to one cup! Exact measuring is needed for cakes, but pie dough…at least mine…is pretty forgiving. A little extra here or there…and it all comes out ok. Put about 2-1/2 cups of flour in the chilled bowl. Add some salt, a half a teaspoon is about enough, and that finishes up the dry ingredients. I use Kerry Gold Irish Butter, either the gold (salted) or silver (unsalted) package. If that is difficult to find in your region, use a foil wrapped European style butter which has a higher fat content and less moisture. Now, if none of these are available where you are, for goodness sake don’t let this stop you from making pie! But, do use butter real butter. Cut the cube at about the 8 tablespoons mark and chunk it up into 6-8 big pieces. Now add, an equal amount of leaf lard. I dip into the leaf lard container with a tablespoon or a soup spoon from my kitchen drawer and add approximately 8 tablespoons to the bowl. If I make one tablespoon too big, I make the next smaller. Think good thoughts before you put your hands in the bowl and make sure they are cold! If it’s hot out, put a bowl of ice water out on the kitchen counter and dip your hands in for a minute to chill them out. Dry them off . Cold hands+warm heart=good pastry maker! Put your hands in and smoosh the fat into the flour. Highly technical language here don’t you think? Just rub the cold fat into the cold flour with your cold hands. Work quickly. When the flour, salt and fats appear to have the sizes of cracker crumbs, peas, almonds and a few small walnut meats, you are finished. Add water. Not too much and nor too little. Generally recipes call for somewhere between 6-8 tablespoons of water. In truth I found it to be anywhere from 3-15! Have you ever made a dough and felt like YOU are the one who must be wrong because even though you followed everything that the recipe said to do, it just doesn’t turn out right? You are not wrong. The recipe just did not give you enough information. This is the art of making a pie. It seems that every day and every dough require a different amount of water even if it is the same recipe! Sprinkle the water over the dough in the bowl and then move it around in the bowl with a fork or with your hands. Don’t spend a lot of time in there. You aren’t making cookie dough; you are just moving the water around so that it is in all parts of the bowl. 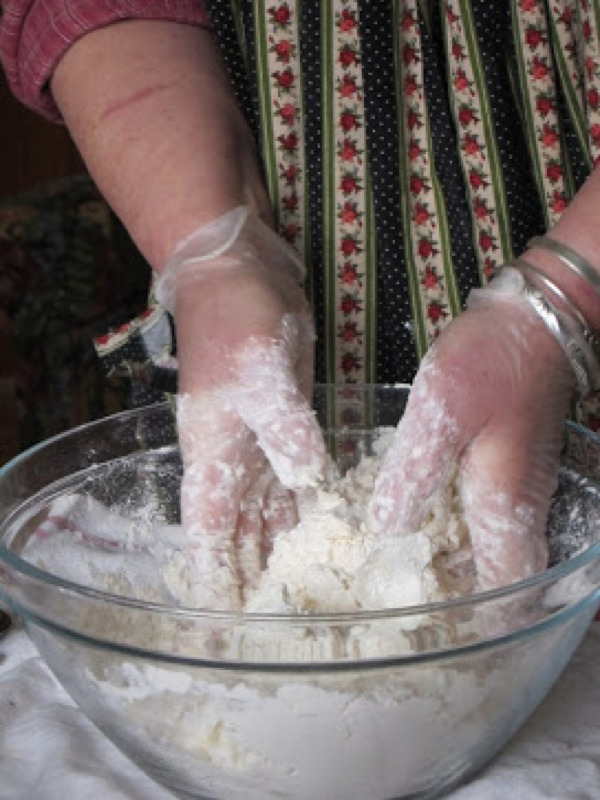 Squeeze a handful of dough with your hand to see if it holds together. If it doesn’t hold together in one place, it’s probably not going to hold together in another place and all you will be doing is warming up the fat so just one squeeze. Remember Rule #1. Sprinkle 2 Tablespoons in the bowl and move the water around. Squeeze a handful. Does it hold together easily? Sprinkle in 1 Tablespoon and move it around with your fork. Keep adding a spoonful at a time until your fork starts to feel a bit sluggish in the bowl. The dough should keep together in your hand and feel moist. Pull it all together and compress into a big ball. It should feel like cool clay or play-dough. Now, cut it in half and shape it into two chubby discs. When Saveur Magazine printed my recipe, they changed chubby to thick. Chubby makes me think of my son’s sweet apple cheeks when he was a little boy and is a very happy word for me, so chubby it is! Wrap the disks tightly in plastic wrap. Let rest and chill in the fridge for about an hour. During that time you can make the filling for your pie and have a cup of tea. Bring the dough out of the fridge. If it feels hard and solid, let it rest at room temperature until it feels a bit pliable. Now some of you may be trembling at the thought of rolling out pie dough. Dough wants to please you. If you say to it, “My pie dough always falls apart”, indeed, you have given it it’s marching orders. Instead, think about other things: A beautiful rose, a stunning sunset, the first time your baby smiled at you…let the dough know that it is going to be just perfect no matter what. Not to worry. There is always a way. Dough is kind of like life. The path isn’t always smooth. Sometimes what feels like an insurmountable boulder blocks our path but we always find a way over, under or around. It may not turn out exactly as planned, but it will be perfect none the less but perhaps in a different way than you expected. Just keep going and it will be fine. Try and keep this in mind as you approach the dough. I roll out on a pastry cloth but really most anything is fine. Marble, wood, plastic, freezer wrap or wax paper. As for a rolling pin, I use a French tapered pin but again there are many options. Wine bottles, canning jars work just fine, too! 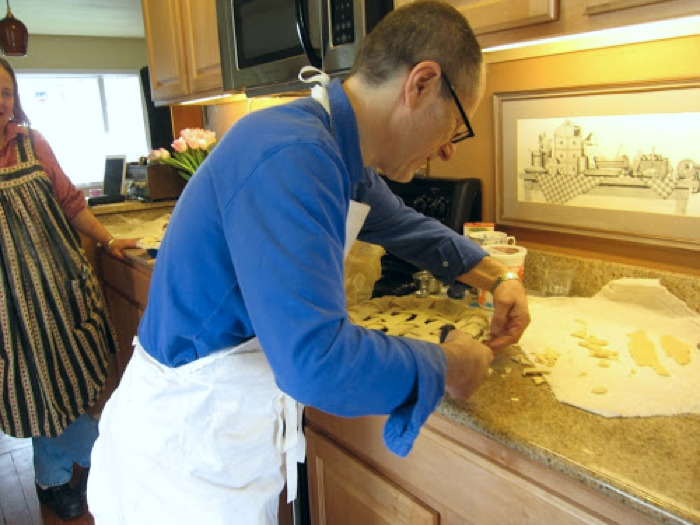 Place a generous hand-full of flour onto the pastry cloth. Unwrap one chubby disc and set it down on the flour. Turn it over so that both sides are covered with flour. Now take your pin and thump the dough a few times on each side. I call this “waking up the dough.” I like to let it know that the main event is just ready to start. Roll from the center away from you and leave a bit of an edge, say 1/2 inch, unrolled. Lift the pin and re-place it in the center of the dough. Now roll towards you leaving that 1/2 inch edge again unrolled. Turn the dough a quarter turn and do it all again. Repeat this until the dough is large enough to roll out from the center like spokes of a bicycle wheel. Move it around a bit to make sure it isn’t sticking on the surface. Remember to think happy thoughts! Roll the dough only as large as it needs to be, about 1-1/2 to 2 inches bigger than your pie pan. It should be about as thick as glass. If it has torn, don’t worry; we can patch it back together with a little ice water. Take a few drops and put it on the back of a patch, pat it in place and move on. Don’t obsess. We want those fats to stay chilly. Remember Rule #1. Once it is big enough, brush off the extra flour. I use a 69-cent brush from my local hardware store. If I don’t have one, I wad up a piece of dry paper towel and brush the flour off with that. Works just fine. Place the rolling pin in the center of the dough and drape it over the pin. Brush off the back side of the dough and gently lift the pin and brush off the back side. Slide the pie plate on to a clean spot on your counter, place the rolling pin with the dough on it in the middle of the pan, put your hands on the wood end of the pin, and quickly and deftly, roll the pin to the edge of the plate. I can’t tell you just how much fun this is when you do it. Adjust the dough in the pan as if you are covering a sleeping baby. Dough has a memory so we don’t want to stretch it. In the baking it will stretch right back. Just let the weight of the dough ease itself down into the pan. OK, get your filling and pour it into the pan. You can pop everything into the fridge at this point while you roll out the top crust in the exact same way. Place it over the filling, get your scissors or knife and give your pie a haircut. Trim so you have about an inch overhang. Quickly turn both edges up all the way around the pan. It’s probably time to remember Rule #1. Too much fussing will just make the fats melt. Don’t worry if it isn’t pretty yet. That’s still to come. You can pop it back in the fridge to chill up for a few minutes if it is feeling a bit soft. 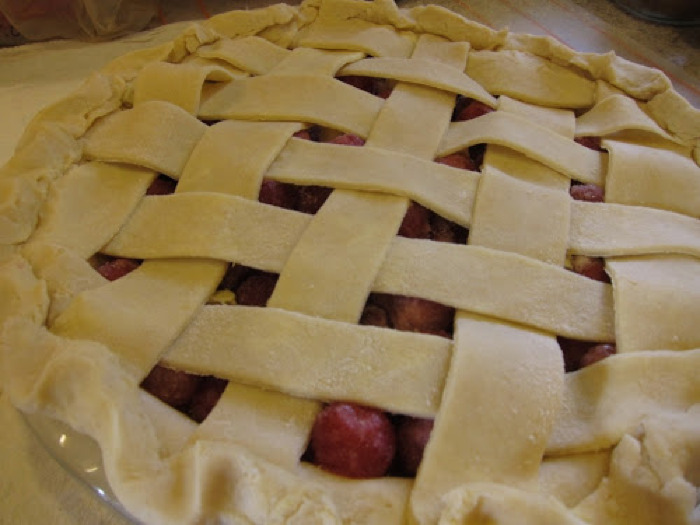 Now, make whatever kind of edge that you want; fork crimp or scalloped, the main purpose of the edge and crimp is to make a sealed reservoir to keep the juices of your pie inside and not on your oven floor. Yes? Cut a few vents. Paint with an egg white wash and sprinkle sugar over the top.